Crab is such an ugly word—the hard k, its suddenness. 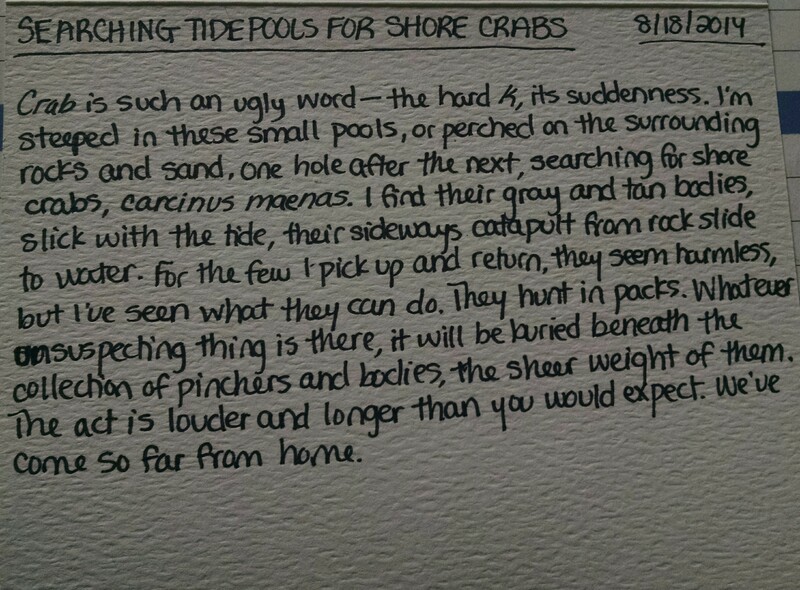 I’m steeped in these small pools, or perched on the surrounding rocks and sand, one hole after the next, searching for shore crabs, carcinus maenas. 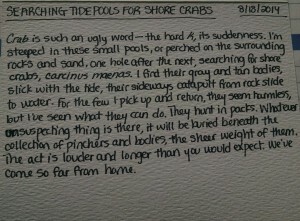 I find their gray and tan bodies, slick with the tide, their sideways catapult from rock slide to water. For the few I pick up and return, they seem harmless, but I’ve seen what they can do. They hunt in packs. Whatever unsuspecting thing is there, it will be buried beneath the collection of pinchers and bodies, the sheer weight of them. The act is louder and longer than you would expect. We’ve come so far from home. Next I Am Running Out of Poems.